Kitchen Architecture’s bulthaup b3 furniture in kaolin laminate with stainless steel and marble work surfaces and a solid oak bar. Stools?? - Could you please tell me where the lovely stools are from? could share how easy alumni splash backs are to mantain pls (scratch? Wooden Leaf Table - Please can you tell me what wood the leaf table on the island is made from? Where did you get that lovely kitchen from? How much light escapes through the skylight at night, if any? Where are the light fittings from? Stainless steelWork an industrial vibe with a stainless steel splashback, which comes in sheets of flat steel that can be fixed directly to the wall with either glue or screws.‘You should only ever clean it using warm water and an e-cloth,’ advises Conrad Hendrick of LWK Kitchens. ‘Over time, the chemicals in common cleaning agents can create a build-up on the steel’s surface. This will make watermarks and fingerprints show much more prominently, leaving your stainless steel not quite so stainless.’Pros Stainless steel is not only affordable, it’s known for its heat-resistant and hard-wearing properties. It’s also easy to clean.Cons Although easy to clean, stainless steel can be difficult to keep looking pristine. It is not scratch-resistant – although minor scratches enhance the look over time – and can dent.Did you know you could buy a splashback right here on Houzz? 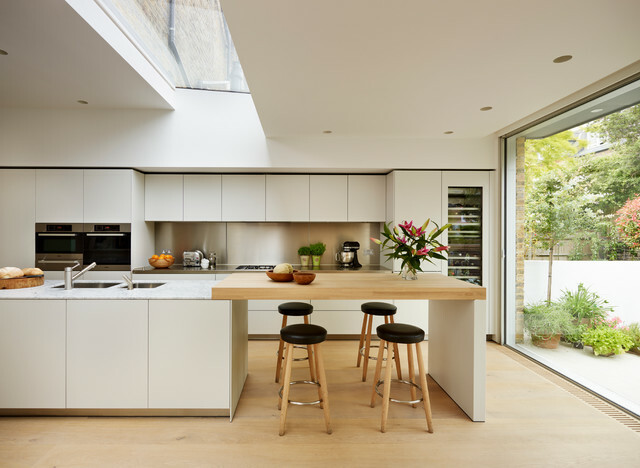 Pull in light from aboveWhether you’re extending, converting or renovating, including roof lights in your kitchen is a fantastic way of introducing more daylight into your design. The higher the light source, the brighter the room will be. If you’re planning a major renovation, installing a roof window is a relatively easy job and can bring in up to 40% more light than a traditional window. Use the style filters on Houzz, such as ‘traditional’ and ‘contemporary’, to find ideas that will work best in your own scheme. A mix of work surfaces (a solid oak bar and a marble-topped countertop) makes for an eye-catching combination in this London kitchen.